Here is a sampling of the work we’ve done recently. As evidence of loyalty to E. Crane Web Design Studio, we’ve been working with almost all of these clients for a very long time. Many of these sites have gone through two to three upgrades during the years we’ve worked together, and our clients have always kept their trust in us and never considered an alternate developer. 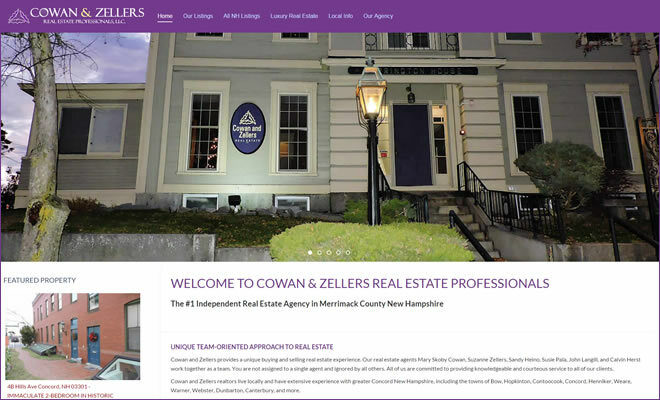 Cowan and Zellers Real Estate Professionals, LLC. is a highly successful independent residential and commercial real estate agency in Concord, New Hampshire. E. Crane has designed and developed their website and provides all maintenance services since 2000. In late December 2015 we did a significant upgrade to the site, allowing for more powerful search and property listing functions. Site Features: Complex Joomla implementation featuring Google API map search, advanced property listings and searches, contact forms, save property functions, etc. Fortitude Health and Training is a vibrant and growing health club and fitness center in Manchester, New Hampshire. In 2015, E. Crane completely redesigned the Fortitude website with a WordPress platform. 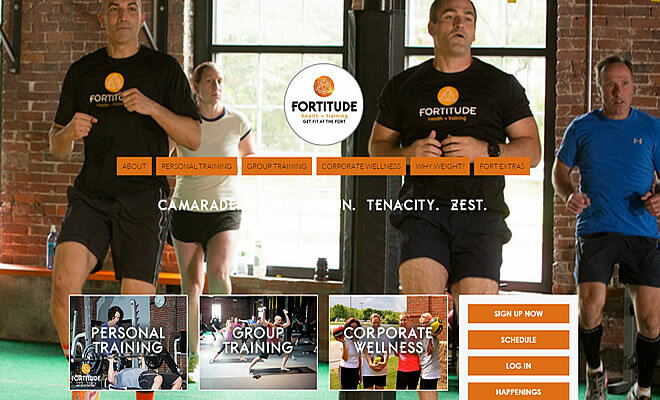 Fortitude wanted a website that reflects the fun, dynamic, and active facility they have created. E. Crane designed responsive pricing tables for the many classes and programs they offer, along with an interactive coaching staff bio/photo area and a series of contact forms. We created a blog for Fortitude to share news and happenings, including recipes and health tips. Site Features: Complex WordPress implementation featuring a blog, pricing tables, contact forms, etc. 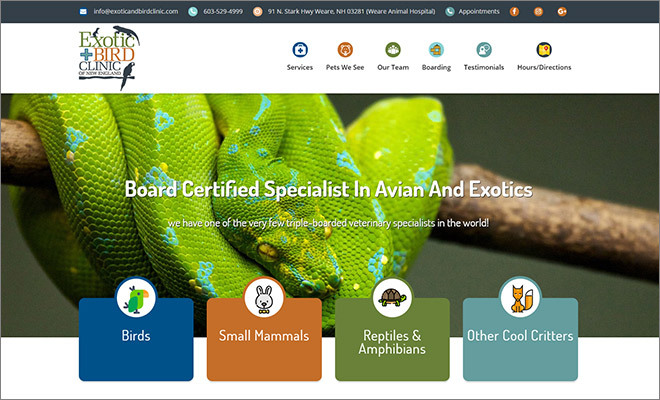 The Exotic and Bird Clinic of New England is a specialized veterinary hospital that treats exotic pets such as birds, ferrets, rabbits, guinea pigs, snakes, and reptiles. In late 2017, we completely renovated their website using Bootstrap. It is now fully responsive and offers viewers an attractive design, a streamlined navigation with easy access to specific information about the various pets treated. Site Features: Bootstrap implementation featuring slideshow animation, Google map, testimonials, and more. Camp Onaway is a summer camp for girls ages 9 - 15 on Newfound Lake in Hebron, New Hampshire. In 2018, they approached E. Crane to develop a new, responsive website. 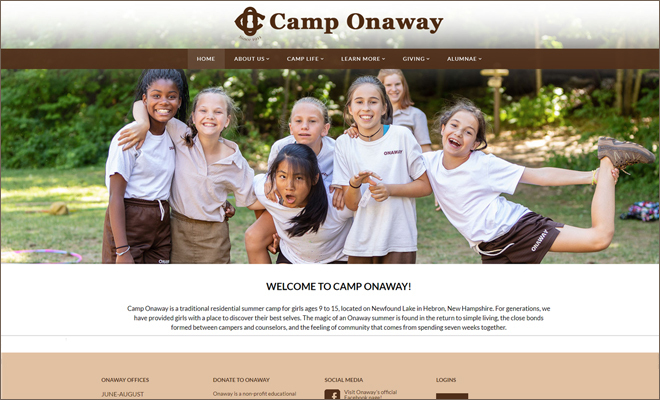 We clarified and enhanced the navigation, updated the look and feel, and added many more photos to showcase the wide range of activities available and to give users a real feel for Onaway camp life. Site Features: WordPress implementation featuring news and events listings, contact forms, audio recordings, photo slideshows, etc. 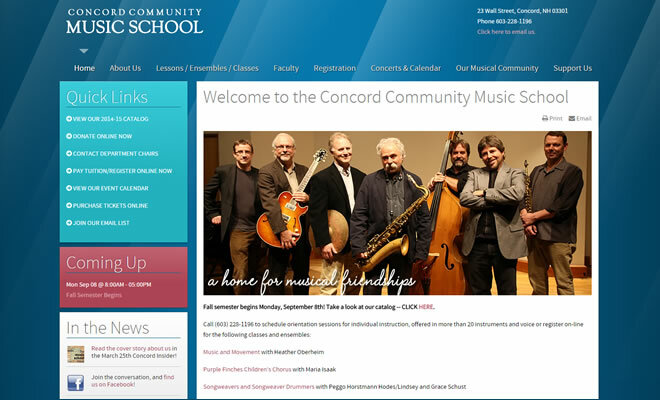 The Concord Community Music School is New Hampshire’s largest community music school. E. Crane's Web Services redesigned and redeveloped their website in 2014. We updated the site's look and feel, created online transaction pages allowing for online registration, ticket sales, and donation. Site Features: Complex Joomla implentation featuring online registration, ticket sales, donations, as well as photo galleries, events calendar, online e-newsletter, contact forms, and more. Hopkinton Animal Hospital is a new, full service veterinary clinic that opened in Hopkinton, NH in 2018. They wanted an engaging and informative site that was relatively simple for users to navigate. 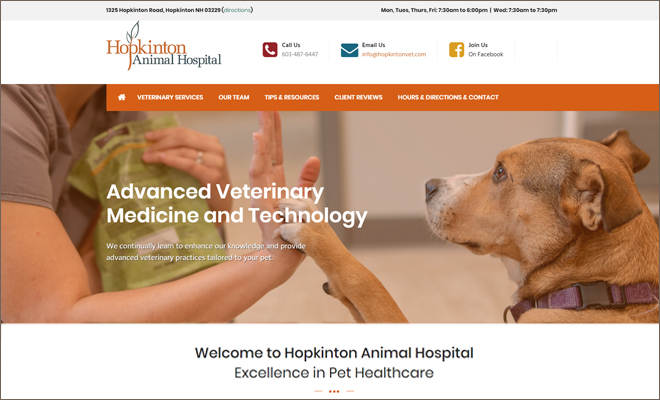 Hopkinton Animal Hospital approached E. Crane's Web Services in 2018 to design and build the site. 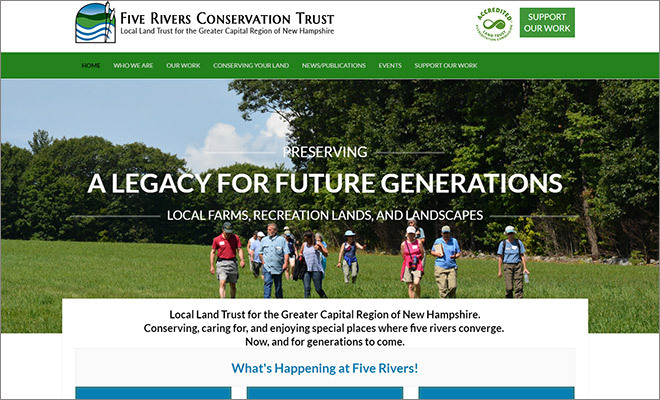 Five Rivers Conservation Trust is the local land trust for the greater Capital Region of New Hampshire, holding valuable conservation easements in Belmont, Boscawen, Bow, Canterbury, Chichester, Concord, Dunbarton, Gilmanton, Hillsborough, Henniker, Hopkinton, Loudon, Northfield, Pembroke, Salisbury, Warner, and Webster New Hampshire. In late 2016 and early 2017, E. Crane Web Design Studio undertook a total redesign of their website. Important new features include both a Google map interface and list by town for all Five Rivers' properties, along with trail maps and public access properties noted. Site Features: WordPress implementation featuring online donation forms, Google map interface, event listings and event registrations, and more. The Veterinary Rehabilitation and Arthritis Center of New Hampshire is a new veterinary specialty business that opened in 2017. It provides physical therapy-like treatment for dogs and cats. The owner approached E. Crane Web Design Studio to create a new and attractive website while focusing strongly on search engine optimization to allow the new business as much early website traffic as possible. Site Features: WordPress implementation featuring photo gallery slideshows, form submissions, Google maps, and more. 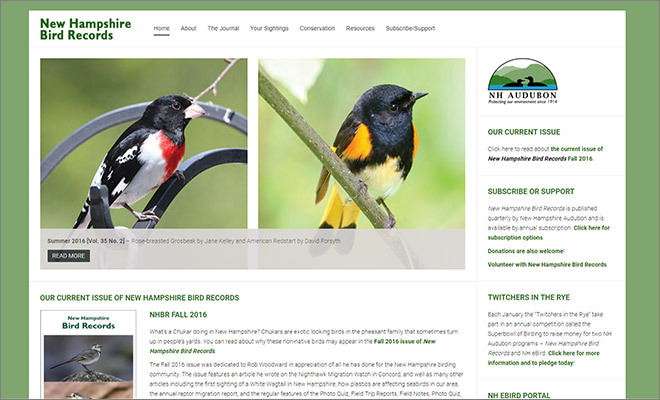 In early 2018, we completed a major update and renovation to the New Hampshire Bird Records website using WordPress. The site is now fully responsive, very current, and tremendously improves the visitor's experience. New Hampshire Bird Records is a quarterly publication, produced by NH Audubon, and is all about birds and birding in New Hampshire. The website includes information about the current and previous issues of the journal, along with important programs organized by NH Audubon such as the Christmas Bird Count, the Backyard Winter Bird Survey, Project Nighthawk, and much more. Site Features: WordPress implementation featuring search functions, photo slideshows, frequently asked questions, contact form, etc. Camp Pasquaney is a summer camp for boys ages 12 - 16 on Newfound Lake in Hebron, New Hampshire -- the oldest continuously operated private summer camp for boys in America. In 2015, E. Crane designed a new, responsive website for Pasquaney. We implemented several online secure forms for accepting donations and a news and events listing with a variety of categories of information. We included many photo galleries to showcase the wide range of activities available to the Pasquaney boys and to give users a real feel for camp life. Site Features: WordPress implementation featuring secure donation forms, news and events listings, contact forms, photo slideshows, etc. 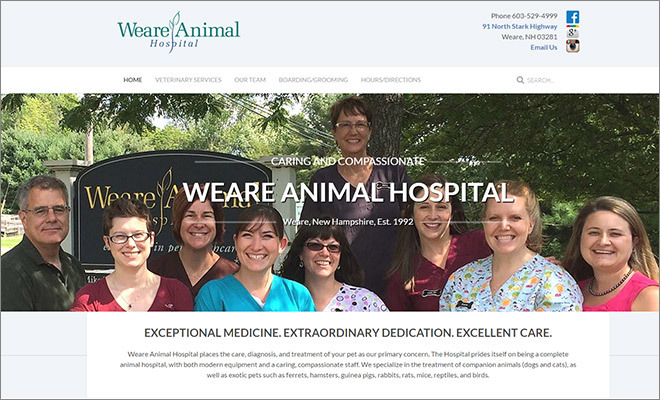 Weare Animal Hospital, a full service veterinary hospital in Weare, New Hampshire, approached E. Crane's Web Services in 2016 to completely redesign their website and to make it fully responsive. 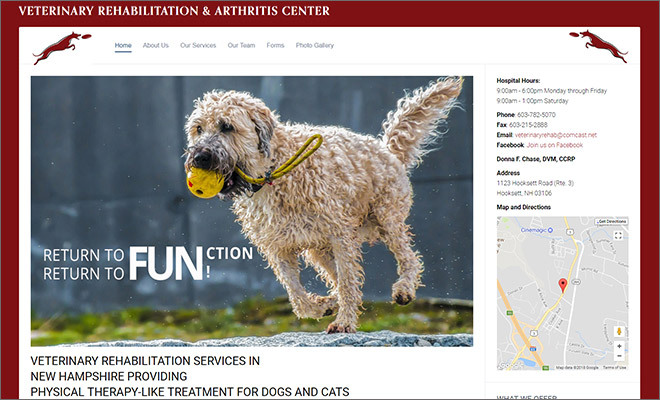 We clarified and enhanced the navigation, updated the look and feel, and added more content to reflect the advanced veterinary services provided. Site Features: WordPress implementation featuring image galleries, blog, and convenient client forms. 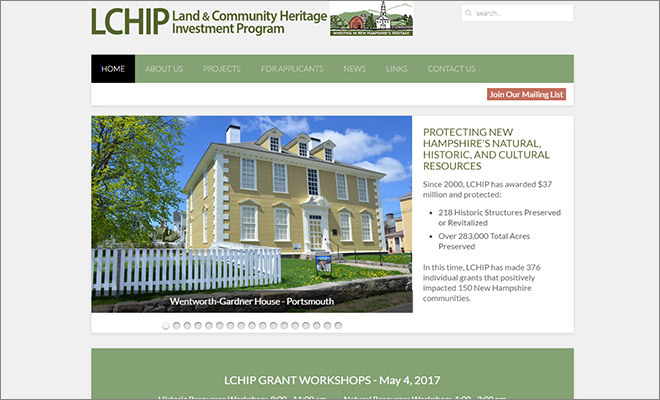 LCHIP (Land and Community Heritage Investment Program) is an independent state authority that makes matching grants to NH communities and non-profits to conserve and preserve New Hampshire's most important natural, cultural and historic resources. In 2016, LCHIP approached E. Crane Web Design Studio to redesign their site. This redesign included an improvement in content organization, a methodology for grant applicants to easily follow, and a vastly improved way to showcase the important work that LCHIP does. Site Features: Joomla implentation featuring Google map and a text list interface to preserved projects and grant recipients, photo galleries, step-by-step procedural interface, and more. 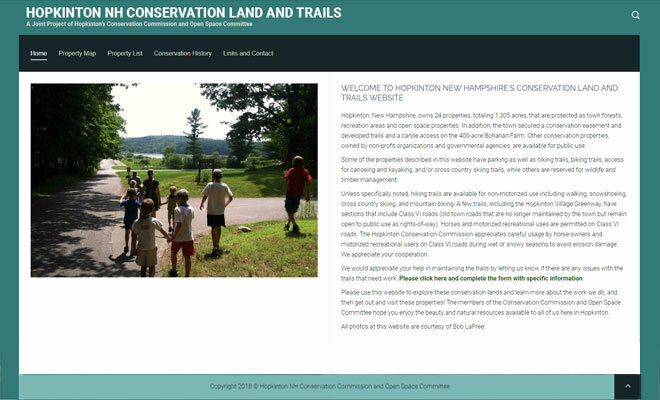 The Hopkinton Conservation Land and Trails website was built new in 2013 and showcases the many conserved properties in the town of Hopkinton, New Hampshire. We developed the site on a tight schedule for the Conservation Commission and Open Space Committee using a WordPress platform and provide access to trail maps, property descriptions, photos, etc. At the present time, we are in the process of updating the website to ensure full mobile responsiveness and to allow a new Google map interface for locating trails and properties. Site Features: WordPress implentation featuring tabbed interface, photo slideshows, embedded Google maps, contact form, etc. 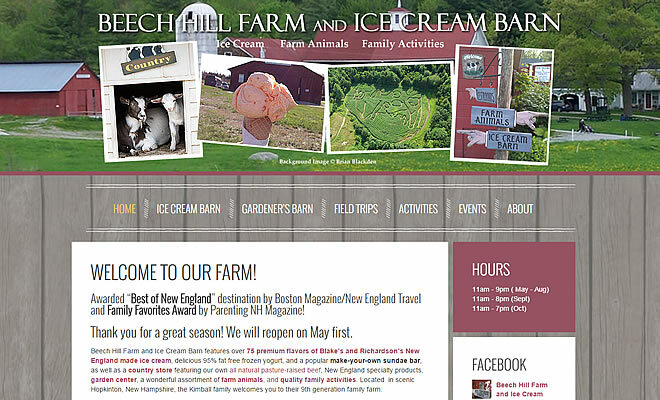 In 2014, Beech Hill Farm and Ice Cream Barn wanted a complete upgrade to their site, on a WordPress platform that would allow them to edit their own website content. Site Features: WordPress implementation featuring photo gallery slideshows, form submissions, Google maps, news & events, and more. 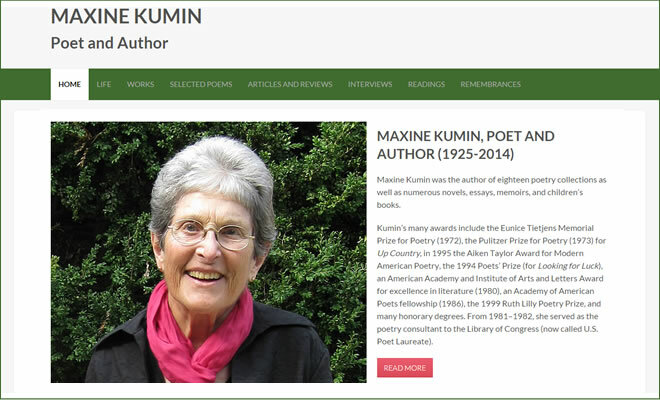 Maxine Kumin (1925-2014) was a Pulitzer Prize winning poet and author. Her website had not been updated in almost 10 years and in 2016 E. Crane Web Design Studio completed a total renovation of the site on a WordPress platform. Working with Susannah Colt, Kumin's personal assistant, we have created a site that provides a rich source of information for students of this important modern poet. We wrote new biographical material and provide information about each of Kumin's works. We present a series of selected poems on a variety of topics. We gathered recordings, links, videos, etc. that have been dispersed throughout the internet for years and organized them at the new site. Site Features: WordPress implementation featuring photo gallery slideshows, portfolios, and more. 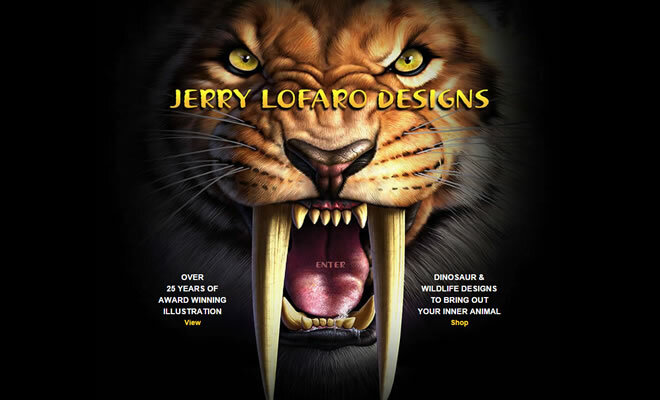 Jerry LoFaro Designs is an e-commerce site that E. Crane built and launched in December 2011. This site showcases award-winning illustrator Jerry LoFaro and offers sale of his growing collection of dynamic T-shirt designs produced by The Mountain. The site also includes Jerry's extensive illustration portfolio and personal history. Site Features: Complex Joomla implentation featuring product sales, guestbook, user registration, and portfolio gallery.